While implementing 7th Pay Commission Report Govt had accepted the recommendations of 7th CPC that Bunching Benefit in the form of one additional increment for every stages of pre-revised (6th CPC) Pay fixed in the same stage in a particular level of 7th Pay Commission Pay Matrix. Subsequently, on 13.06.2017, Department of Expenditure, Ministry of Finance, withheld the 7th Pay Commission Pay fixation with bunching benefit vide Office Memorandum 1-6/2016-lC(Pt.) dated 136.2017, for not following uniform procedure for determining 7th Pay Commission Bunching benefit. Now, Department of Expenditure, Ministry of Finance has come up with a clarificatory Office Memorandum dated 03.08.2017. As per the clarification in OM dated 03.08.2017, Pay stages below the 6th CPC Entry Pay mentioned in any Level of 7th CPC Pay Matrix are not to be taken in to account for determining Bunching benefit. For instance, as per 7th Pay Commission Pay Matrix which contains 6th CPC entry pay for each level, entry pay (6th cpc) for pay level 7 is 17,140. Hence, all 6th CPC Pay stages below 17,140 when fixed in 7th Pay Commission Pay Matrix will not be entitled to bunching benefit even two or more stages below 17,140 are getting bunched and fixed in the same stage in level 7 of 7th Pay Commission Pay Matrix. 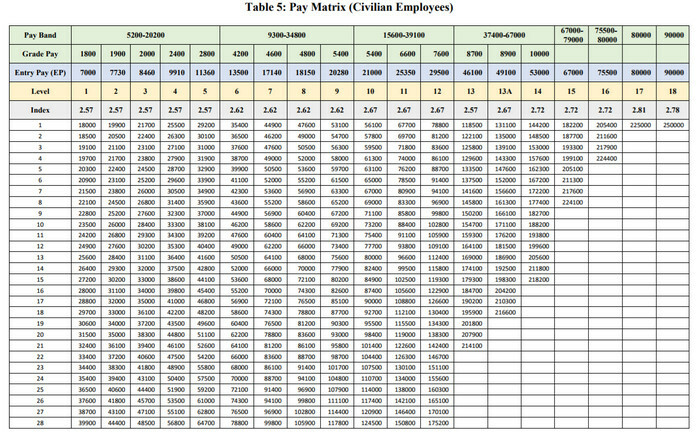 The 7th Pay Commission Pay Matrix containing 6th CPC entry pay for each level is given below for reference purpose. Subject: Recommendations of the 7th Central Pay Commission (CPC) – bunching of stages in the revised pay structure under Central Civil Services (Revised Pay) Rules, 2016. 2. The provisions giving effect to the recommendations of the 7th CPC on extending the benefit on account of bunching were notified vide DoE OM. dated 07.09.2016. Benefits on account of bunching have been extended during the initial fixation of pay in the revised pay structure while implementing the recommendations of earlier CPCs also. Bunching occurs in the fixation of pay when the pay at two or more consecutive stages in a Pay Scale/ Grade Pay in the pre revised scale get fixed at the same stage in the corresponding Pay Scale/ Level in the revised pay structure. 3. The modalities of determining the extent of bunching and the nature of benefits to be extended on account thereof, based on the recommendations of the CPCs, have differed across different Pay Commission periods. While the 5th CPC recommended that benefits be extended when more than four stages get bunched, the 6th CPC recommended that benefits be extended when two or more stages get bunched. The fitment tables drawn by the 6th CPC and notified by the Government subsequently provided for the benefit of bunching only when more than two stages were bunched. As regards the benefits to be extended on account of bunching, the 5th CPC recommended benefit of one increment for every four consecutive stages bunched, the 6th CPC recommended benefit of one increment for every two consecutive pay stages bunched. For HAG scales, however, benefit of one increment was given at each of the pay stages in the 6th CPC pay structure. 4. In terms of the DoE OM. dated 07.09.2016 based on the 7th CPC recommendations, bunching occurs when two or more stages get bunched and benefit of one increment is to be given for every two stages bunched. These provisions are to be applied while revising the pay from the 6th CPC regime to the 7th CPC regime. In the 6th CPC pay structure, about 35 pay scales existing in the 5th CPC pay structure were replaced by a system of running pay bands recommended by the 6th CPC. The 6th CPC pay structure consisted of 19 grades spread across four distinct pay bands and 4 distinct scales including two fixed scales. The 6th pay structure being replaced by the 7th CPC recommended Pay Matrix, thus, consists of 4 Pay Bands with 15 levels of Grade Pay, along with 4 standalone scales, viz., HAG scale, HAG+ scale, Apex scale (fixed) and the scale of Cabinet Secretary (fixed). 5. While in the 5th CPC structure, the stages in every pay scale were well defined, the stages were not well defined in the 6th CPC structure. The pay was to be fixed in the running Pay Band by rounding off to the next higher multiple of 10. Every multiple of 10 was a pay stage in the 6th CPC regime. However, all consecutive 10 rupee stages for any Grade Pay cannot be taken as consecutive stages for the purpose of bunching in reference to the 7th CPC recommendations as is also clear from the illustration contained in para 5.1.37 of the 7th CPC Report. Based on the illustration contained in para 5.1.37 of the 7th CPC Report, Department of Expenditure’s OM. dated 07.09.2016 provided that a difference of at least 3%, the rate of annual increment, in the 6th CPC pay structure was essential for counting of two stages. The 6th CPC had replaced the system of equidistant pay stages in a pay scale based on equal annual increments in the 5th CPC regime by a system of annual increment of 3% on the sum of pay in the running pay band and the Grade Pay which was to be added to the running pay as increment. Therefore, the pay stages in any given Grade Pay were specific to an employee and depended upon the initial fixation of pay in that Grade Pay. As a result, the amount of increment earned in the same Grade Pay would differ in the same Pay Scale/ Grade Pay not only between different employees but also across years for the same employee. To illustrate, an employee whose pay was fixed at Rs 46,100 in GP of 8700 in PB-4 would have the first annual increment of Rs 1390 which would be added to his running pay in the Pay Band, another employee whose pay initially was fixed at Rs 46,400 in the same Grade Pay would have the first annual increment of Rs 1400. In such a scenario where the pay stages are specific to the employee, it is not possible to arrive at universal pay stages for the purpose of determining the extent of bunching. Therefore, for the purpose of determining the extent of bunching in a system of running pay bands, the consecutive pay stages that need to be considered are the pay stages which are specific to the employee. 7. In the revised dispensation for pay fixation in the New Pay Structure as recommended by the 7th CPC, direct recruits shall start at the minimum pay corresponding to the level to which recruitment is made, which will be the first cell of each level. For those promoted from the previous level, the fixation of pay in the new level will depend on the pay they were already drawing in the previous level. The pay, however, cannot be less than the first stage of the relevant level. While enumerating the benefits of migrating to the new system at para 5.1.47 of the 7th CPC Report, it has been stated that ‘the issue of differential entry pay has been resolved’. At para 5.1.36 of the 7th CPC Report it has also been mentioned that rationalization has been done with utmost care to ensure minimum bunching at most levels. Rationalization has been done by the 7th CPC through the Index of Rationalisation (IoR) which has been multiplied with the Entry Pay in the 6th CPC regime to arrive at the first cell of each level. With the Entry Pay along with IOR being used as the determiner of the first cell, pay stages below the Entry Pay have been consciously brought up to the level of Entry Pay and its corresponding pay stage in the revised pay structure. As a result, all pay stages below the Entry Pay in any Level will, on re-fixation, converge to the first pay stage in that level. As this convergence takes place on account of a conscious decision of the 7th CPC intrinsic to the architecture of the Pay Matrix by indicating the Entry Pay as the starting point of each Level, benefit on account of bunching cannot be extended with reference to pay stages lower than the Entry Pay indicated by the 7th CPC for that level in the Pay Matrix. Extending the benefit of bunching with reference to pay stages below the entry pay will perpetuate the difference in pay on account of differential Entry Pay which was addressed by the 7th CPC.